This recipe doesn’t get much easier. Super tender carnitas that can be started the night before and ready within 20 minutes for dinner. Add guacamole, cilantro, cheese, sour cream, rice and salsa and you have a full Chipotle bowl at home. Pre-heat your sous vide water bath to 165 degrees F (73 degrees C). Combine pork, onion, garlic, cinnamon, bay leaves and orange in large bowl. Generously salt and toss to combine. Transfer items to 1-2 vacuum bags and seal, try to keep the bags fairly flat and even in one layer. Add bags to water bath and cook at 165 degrees (73 degrees C) for 12-24 hours. Once cooked, remove pork from bags, discarding everything else, and place on large rimmed baking sheet. Turn oven broiler on and set an oven rack about 3″ below broiler. 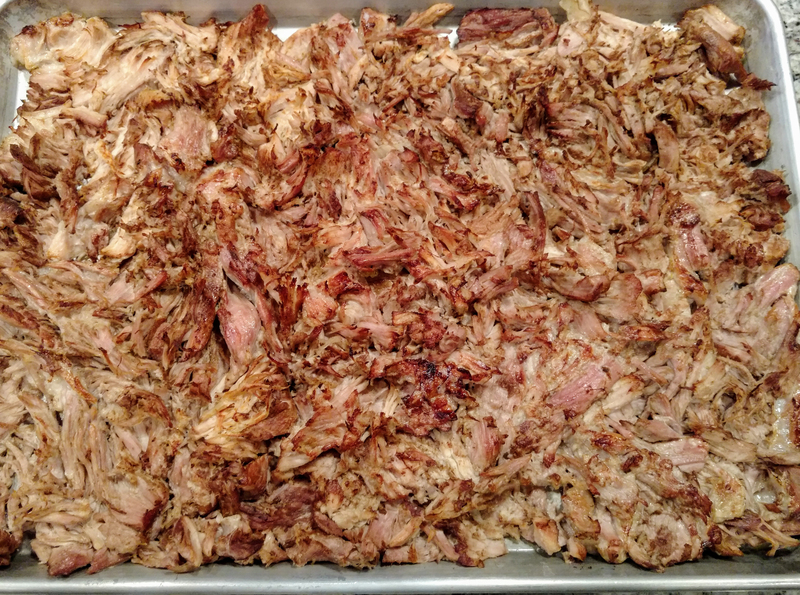 Shred pork with forks / fingers and spread out over baking sheet. Try to keep it pretty flat on a single layer. Place under broiler and cook for 5-10 minutes to brown and crisp the pieces. Remove from oven and top with fresh lime juice and cilantro.